Figure 1:Mantle-peridotite xenolith from San Carlos Indian Reservation, Gila Co., Arizona, U.S. The xenolith is dominated by green peridot olivine, together with black orthopyroxene and spinel crystals, and rare grass-green diopside grains. The fine-grained gray rock in this image is the host basalt. The pyroxenes are a group of important rock-forming silicate minerals found in many igneous and metamorphic rocks. They share a common structure comprised of single chains of silica tetrahedra and they crystalize in the monoclinic and orthorhombic system. Pyroxenes have the general formula XY(Si,Al)2O6 (where X represents calcium, sodium, iron+2, and magnesium, and more rarely zinc, manganese, and lithium, and Y represents ions of smaller size, such as chromium, aluminum, iron+3, magnesium, manganese, scandium, titanium, vanadium, and even iron+2). Although aluminum substitutes extensively for silicon in silicates such as feldspars and amphiboles, the substitution occurs only to a limited extent in most pyroxenes. The name pyroxene comes from the Greek words for "fire" and "stranger." It was named that way due to their presence in volcanic lavas, where they are sometimes seen as crystals embedded in volcanic glass; it was assumed they were impurities in the glass, hence the name, "fire strangers." However, they are simply early forming minerals that crystallized before the lava erupted. The upper mantle of Earth is composed mainly of olivine and pyroxene. 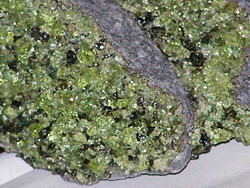 A piece of the mantle is shown in Figure 1 (orthopyroxene is black, diopside—containing chromium—is bright green, and olivine is yellow-green) and is dominated by olivine, typical for common peridotite. Pyroxene and feldspar are the major minerals in basalt and gabbro. The chain silicate structure of the pyroxenes offers much flexibility in the incorporation of various cations and the names of the pyroxene minerals are primarily defined by their chemical composition. Pyroxene minerals are named according to the chemical species occupying the octahedral X (or M1) and Y (or M2) sites and the tetrahedral T site. Twenty mineral names are recognized by the International Mineralogical Association's Commission on New Minerals and Mineral Names and 105 previously used names have been discarded (Morimoto et al., 1989). A typical pyroxene has mostly silicon in the tetrahedral site and predominately ions with a charge of +2 in both of the octahedral (X and Y) sites, giving the approximate formula XYT2O6. The names of the common calcium-iron-magnesium pyroxenes are defined in the "pyroxene quadrilateral" shown in Figure 2. The enstatite-ferrosilite series ([Mg,Fe]SiO3) contain up to 5 mol. 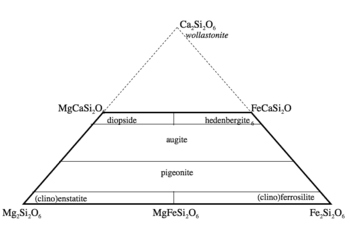 percent calcium and exists in three polymorphs, orthorhombic orthoenstatite, protoenstatite, and monoclinic clinoenstatite (and the ferrosilite equivalents). Increasing the calcium content prevents the formation of the orthorhombic phases and pigeonite ([Mg,Fe,Ca][Mg,Fe]Si2O6) only crystallizes in the monoclinic system. There is not a complete solid solution in calcium content and Mg-Fe-Ca pyroxenes with calcium contents between about 15 and 25 mol. percent are not stable with respect to a pair of exolved crystals. This leads to a miscibility gap between pigeonite and augite compositions. There is an arbitrary separation between augite and the diopside-hedenbergite (CaMgSi2O6 - CaFeSi2O6) solid solution. The divide is taken at >45 mol. percent Ca. As the calcium ion cannot occupy the Y site, pyroxenes with more than 50 mol. percent calcium are not possible. A related mineral, wollastonite, has the formula of the hypothetical calcium end member but important structural differences mean that it is not grouped with the pyroxenes. Figure 3: The nomenclature of the sodium pyroxenes. Magnesium, calcium, and iron are by no means the only cations that can occupy the X and Y sites in the pyroxene structure. A second important series of pyroxene minerals are the sodium-rich pyroxenes, corresponding to nomenclature shown in Figure 3. The inclusion of sodium, which has a charge of +1, into the pyroxene implies the need for a mechanism to make up the "missing" positive charge. In jadeite and aegirine, this is added by the inclusion of a +3 cation (aluminium and iron(III), respectively) on the X site. Sodium pyroxenes with more than 20 mol. 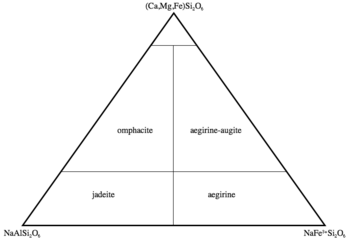 percent calcium, magnesium or iron(II) components are known as omphacite and aegirine-augite, with 80 percent or more of these components the pyroxene falls in the quadrilateral shown in figure 1. Coupled substitutions of 1+ and 3+ ions on the Y and X sites respectively. For example Na and Al give the jadeite (NaAlSi2O6) composition. Coupled substitution of a 1+ ion on the Y site and a mixture of equal numbers of 2+ and 4+ ions on the X site. This leads to, for example, NaFe2+0.5Ti4+0.5Si2O6. The Tschermak substitution where a 3+ ion ocupies the X site and a T site leading to, for example, CaAlAlSiO6. Morimoto, Nobuo, et al. 1989. Nomenclature of pyroxenes. Canadian Mineralogist 27:143-156. Retrieved April 13, 2007. This page was last modified on 17 June 2015, at 15:29.